The BorderImage type is used to create borders out of images by scaling or tiling parts of each image. The corners (regions 1, 3, 7, and 9) are not scaled at all. Regions 2 and 8 are scaled according to horizontalTileMode. Regions 4 and 6 are scaled according to verticalTileMode. The middle (region 5) is scaled according to both horizontalTileMode and verticalTileMode. The regions of the image are defined using the border property group, which describes the distance from each edge of the source image to use as a border. The following examples show the effects of the different modes on an image. 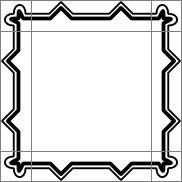 Guide lines are overlaid onto the image to show the different regions of the image as described above. An unscaled image is displayed using an Image. The border property is used to determine the parts of the image that will lie inside the unscaled corner areas and the parts that will be stretched horizontally and vertically. A BorderImage is used to display the image, and it is given a size that is larger than the original image. Since the horizontalTileMode property is set to BorderImage.Stretch, the parts of image in regions 2 and 8 are stretched horizontally. Since the verticalTileMode property is set to BorderImage.Stretch, the parts of image in regions 4 and 6 are stretched vertically. Again, a large BorderImage is used to display the image. 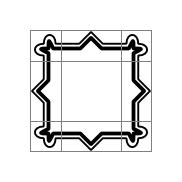 With the horizontalTileMode property set to BorderImage.Repeat, the parts of image in regions 2 and 8 are tiled so that they fill the space at the top and bottom of the item. Similarly, the verticalTileMode property is set to BorderImage.Repeat, the parts of image in regions 4 and 6 are tiled so that they fill the space at the left and right of the item. In some situations, the width of regions 2 and 8 may not be an exact multiple of the width of the corresponding regions in the source image. Similarly, the height of regions 4 and 6 may not be an exact multiple of the height of the corresponding regions. It can be useful to use BorderImage.Round instead of BorderImage.Repeat in cases like these. The Border Image example in Qt Quick Examples - Image Elements shows how a BorderImage can be used to simulate a shadow effect on a rectangular item. The source image may not be loaded instantaneously, depending on its original location. Loading progress can be monitored with the progress property. See also Image and AnimatedImage. Each border line (left, right, top, and bottom) specifies an offset in pixels from the respective edge of the source image. By default, each border line has a value of 0. The border lines can also be specified using a .sci file. This property describes how to repeat or stretch the middle parts of the border image. BorderImage.Stretch - Scales the image to fit to the available area. BorderImage.Repeat - Tile the image until there is no more space. May crop the last image. BorderImage.Round - Like Repeat, but scales the images down to ensure that the last image is not cropped. The default tile mode for each property is BorderImage.Stretch. BorderImage can handle any image format supported by Qt, loaded from any URL scheme supported by Qt. 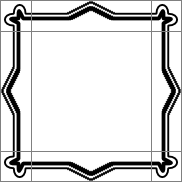 This property can also be used to refer to .sci files, which are written in a QML-specific, text-based format that specifies the borders, the image file and the tile rules for a given border image. In BorderImage, this property is read-only.